CCTV cameras are designed to collect the reflected light from objects around them and then to convert them into electronic video signals that measure 1 Vpp (Volt, peak to peak). These signals then are transported by one of the many transmission mediums to the monitor, where these signals are converted back to visible light on a CCTV monitor. Camera systems often appear to be complicated; but in truth, they can be categorized into three groups. Video collection: This part collects the image from the object and sends it via the transmission media to the processing end. It is constructed from camera, lens, power and mounting accessories. Signal Transmission Medium: This media receives the signal from the camera and transmits it to the video management system with the lowest possible attenuation. This media can be wired or wireless transmission. Video management: This end will receive the signal and process it to be viewed. The system constitutes of a video processing unit, recording unit and a monitor. A Digital video recorder (DVR)/ Network video Recorder NVR) is a device that records video in a digital format to a disk drive or other memory medium within a device. The variants come in various forms of Channels. 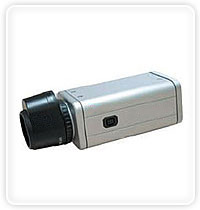 A type of video camera often used in surveillance systems, named because of its shape and size. 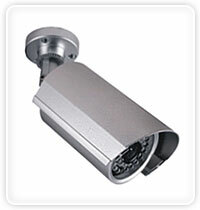 Bullet cameras are small (2 to 2.5 inches long) and are limited to a fixed focal length lens. While bullet cameras are good for small spaces, the images may have slightly cut-off corners because the camera shape and design can interfere with the actions of the of the camera lens and filter. 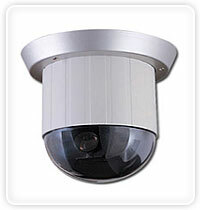 For less secretive applications the Dome Camera is a perfect camera choice. Easy to install and very small this completely enclosed camera can be used in Hotels, public areas and in retail operations that demand minimal aesthetic intrusion. They are available in fixed focal and vari- focal lenses. Box cameras are the more traditional type of CCTV camera you see in many buildings, used internally or externally with weatherproof housing. There is a large range with many different features including Wide dynamic Range, Day & Night, Zoom & super High Resolution. Different types of lenses can be attached based on specific needs. 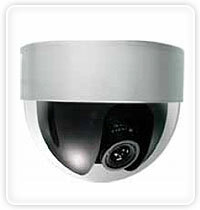 Pan Tilt and Zoom or PTZ cameras are cameras that can be controlled, or pre-set to pan tilt and zoom around its surroundings for complete surveillance. They are full of features like weather proof, day and night, zoom, hi resolution and much more. They are mainly used in high end applications and are excellent when used in conjunction with manned guards who can control the PTZ cameras to keep an eye on anything suspicious without raising awareness.